Can Electric Mopeds & Motorcycles Help With Moped Crime? I read with interest the piece from John Richards of Chelsea Scooters in last months Dealer News and wanted to comment. There are two aspects to crime. One is the crime enabled by mopeds which according to the recent figures, in London at least has come down significantly in the last year thanks to some clever tactics employed by the Police themselves. While the national figure is over 400 per week, London has seen its share fall to under 300. Tactics include, more nimble scooters rather than the big heavyweight BMWs to enable them to follow where the thieves go, remote controlled spikes and florescent “DNA” spray enabling them to catch the thieves later. The other aspect however is theft of the moped itself. According to the Met, over 14000 mopeds were stolen just in London last year. Some of these are then to be used by the moped thieves for their own crime but of course some are for re-sale, export etc. With these figures in mind, its no surprise Insurance rates are becoming challenging for riders. While Richards comment is true that crime is a bigger problem than emissions, we would suggest there is a solution to both and that comes in the form of adopting electric motorcycles or mopeds. While its obvious that electric can deal with the emission challenge, what it can also deal with is the theft problem. The reason being that the majority of electric mopeds and some of the lower end motorcycles come with removable batteries. Imagine if you were able to take out your 4 stroke OHC from your Honda Vision 110 when you left it (locked up) at night outside your house. That’s effectively exactly what youre doing with an electric motorcycle. Take out the batteries and it becomes useless to thieves. No hot-wiring possible, no taking it to a petrol station and riding off without paying before you go and steal someones mobile phone. Totally useless and to help in that, we provide stickers to all our customer that warn potential thieves that they are wasting their time and move on which is essentially what all deterrents are…..pick on the next guy not me. If the bike was still stolen, would a thief want to pay the price of a new battery at about £700? I seriously doubt it in the same way would they want to pay for a petrol engine at not much less than that in a stolen moped if they needed one for it? So yes, by all means, lock it up, cover it up but removing the power source is a far better alternative in our opinion. Batteries weigh about 8KG so taking them short distances to your home or office shouldn’t be too onerous and all but one of our 7 ranges provide them. With regards to Insurance being a challenge for would-be riders. Insurers should actually be encouraging the take-up off electric mopeds for exactly this reason too and make “taking out batteries” a condition of providing lower insurance for them over petrol. This saving would then go towards to diminishing overhead electric purchases currently pay over their petrol equivalents to buy one. Either through Government policy or choice, the days of electric mopeds and motorcycles are coming and this is just another advantage they carry over their noiser, dirtier and more expensive to run alternatives. This entry was posted in Posts and tagged Electric Moped Motorcycle crime theft on 05/08/2018 by Green-Mopeds. Have you ever heard of an electric moped? Not a scooter that teens zip around on – but a full-sized motorbike moped? I hadn’t. Having met the CEO of Green Mopeds at the recent Caravan, Camping and Motorhome Show at the NEC, we were lucky enough to trial an electric moped for a couple of weeks. And I was really impressed with it. With the increase in the price of petrol, electric transport is clearly the way to go. And with our congested roads, a switch to a moped/motorbike might just speed up your journey. Combine the two, and you have an electric moped. I’ve always been a bit wary of mopeds and motorbikes. However, when the opportunity came along for me to test drive an electric moped, I looked forward to the experience. And it was truly eye opening. The moped was an ECCity 50 model from French manufacturer Artelec. It was sturdy, dependable and stylishly fashionable. With a range of up to 75 miles per charge (depending upon terrain) I was able to get around on all our local roads with no problem. ECCity represents the premium end of the electric moped market. With exceptionally high quality they have a French ‘chic’ styling and can offer great performance in an environmentally friendly package. I cried when I had to give it back! The moped charges from any 240v socket and is ideal for local journeys. You could ride to work and then charge up during the working day to ride home. The charger and 2 metre power lead are in the seat compartment and will charge the bike fully within 8-9 hours. This means a charge at work would be able to get you back home with no problem. The model I tested was the 4kw Model 50 (L1e), which is the equivalent of a 50cc petrol engine. This meant the top speed on the open road was around 30mph. It does seem fast when you are riding. The bike costs around 40 pence to fully charge and although it is around £6,500 to buy it requires very little maintenance (tyres and brake pads) and would last for years. Remember, in the UK, there’ll be no road tax to pay. The Samsung lithium ion battery has a life cycle of around 30,000 miles. I would rate it as ideal personal transport to get to work or shops. It could cut your transport costs in half. Remember 90% of our journeys are under ten miles. I would rate my overall experience with the bike as excellent. It did everything I required. A delight to use. The 150kg moped was a little heavy to manoeuvre but there is a reverse gear to help with this. The twist grip gives instant torque and so care must be taken that the whole shebang doesn’t shoot off without you. There are no formal gears and so it is very easy to use and handle. I loved it. Security was not an issue: a lock through the front brake disc immobilised the bike during all my journeys and was ample along with the steering lock. Anyone wanting to steal it would require a hoist and a truck. The brakes are 220mm disk brakes with double piston callipers on both front and rear. I can vouch for the effective brakes as a van stopped suddenly in front of me on one trip and I was able to do a semi-emergency stop on a sixpence. Some people might worry about the storage space on this bike. 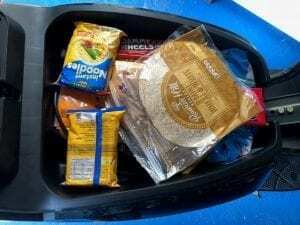 I was able to do a weekly shop at Lidl’s and fit it all into the storage compartments. There is a big compartment under the armchair-like seat (bit like a Harley seat). 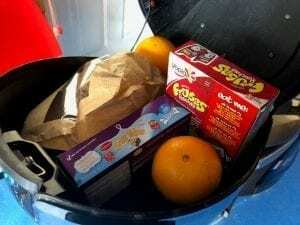 There is also the top box. Both of these allowed me to stash my bread milk and melons with no issues! To be honest I zipped around all over the place doing 30-mile round trips with no problems whatsoever. The moped was robust and sturdy on the road allowing freedom to carry shopping or park at the railway station for the daily commute. Parking was really easy. Locking it up was a cinch and charging it took little effort. The controls were really easy. There is a speedo, a charge indicator telling you how much juice you have left, indicators with a bleeper to warn about you turning. There were even colour-coded retractable foot rests for any pillion passengers. You can connect an ECCity moped to an app on your smartphone – you can use your phone GPS and monitor battery life etc. The 4kw Model 50 (L1e) gave brilliant performance – the equivalent or better than any traditional 50cc bike. I would buy one. It occured to me that this 2-seater moped would be perfectly suited to motorhome uses wanting the freedom of a vehicle once they are pitched on-site. My only concern with the ECCity 50 is its heavy weight, but it would be easier to transport on a rear carrier than a car would be. This entry was posted in Posts on 22/05/2018 by Green-Mopeds. 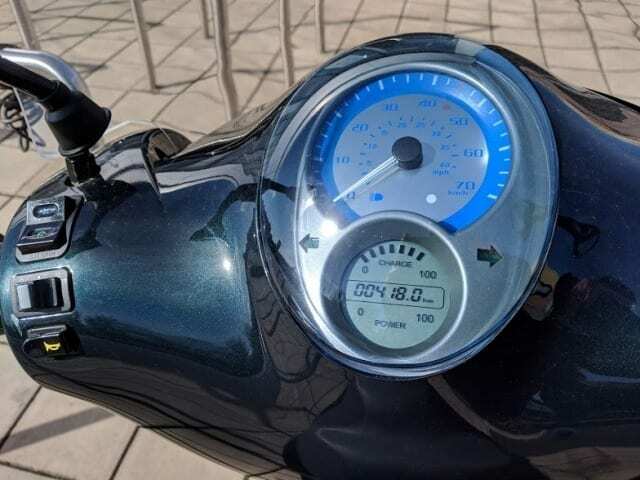 This entry was posted in Posts and tagged #EV Electric motorcycles on 17/05/2018 by Green-Mopeds. thedangold part-time tattooist, part-time bike builder, part-time artist, full-time geek. Made a TV show with Discovery called ‘London Ink’ and has ridden for over 30 years pausing only while broken bones heeled. As I walk up to the Artelec (the French manufacturer) there’s nothing to suggest that it’s not an ordinary scooter. The styling of the 470 can at best be described as traditional, not in a retro kinda way but traditional in a more contemporary scooter kinda way. It seems to me that the ECCity 50, as it’s more easily known, is quite happy and maybe even proud to be scooter and why not, it does everything a scooter should do very well. 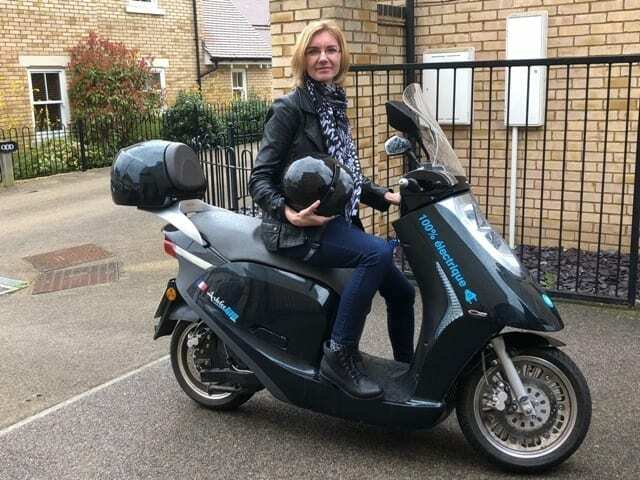 Its good at being a scooter, and the chunky but chic styling has grown on me – I have to admit I have become rather fond of the way this little scooters looks. As you get closer it becomes clear that this is a premium product, no flimsy cheap plastic here just the good quality stuff and lots of it, all finished in what ECCity call Champagne (that’s brown to you and me) and you know what? The colour actually suits this little bike, they have even taken the time and care to paint the wing mirrors and the top box in brown, sorry I mean Champagne, too and not forgetting the rather cool pillion foot pegs that folds into the body work and disappear almost like a Teslar’s door handles (almost). The ECCity sits on a set of very stylish 13inch wheels – they are of the more solid kind and look like they’ve come straight off a Citroen CX Turbo from the mid 90s, very French. A nice little touch – the stopping power comes from 220mm disk brakes with double piston callipers both front and rear it’s all very impressive and gives great stopping power with enough feel to always come to a safe stop. The seat is very wide, a bit too wide for my liking but never-the-less comfortable, comfortable enough even for the longest of journeys or days where I was in the saddle the whole day and the riding position will be very familiar to anyone who’s ever ridden a traditional scooter so that means very comfortable in that familiar body upright, legs forward almost like your sitting on a chair kinda way, this is however where the similarities to a normal scooter ends and things start to get a little strange. Turn the surprisingly flimsy keys (I never did get used to it) and you get the first sign that this is no ordinary scooter because the only thing that happens is a little green light comes on under the funky Jetson-style space-age digital dashboard hmm…it is now apparently ready to go. Twist the throttle and under its champagne coloured body work you are now sending tiny little lithium ions from the negative side of the German built Samsung battery back across the electrolyte to the positive electrode, thus producing the current that carries the electrons from the battery to a set of floating magnets located inside the back wheel. This creates a rotating magnetic field causing the motor to spin, turning potential energy into kinetic energy thus propelling the little scooter forward or at least I think that’s how it works, I could be wrong. Right…! Having established that this bike in fact runs on witchcraft and black magic and having also established that I have no idea how the witchcraft that is electricity or the black magic of ions actually works we can move on to what I DO know and that is – electricity is a great way to propel certain vehicles, take for example the bullet train or bumper cars, two fantastic examples where electricity works better than the internal combustion engine. Now I know that the ECCity 50 is neither a bumper car nor is it a bullet train but could scooters be another example where electricity trumps the petrol engine perhaps? The Artelec is off to a great start, twist the chunky throttle and because of the unique way an electric motor works you get all of the power and all of the torque instantly, this soon becomes very addictive and it never failed to put a smile on my face to out-accelerate pizza delivery guys at the lights or silently sneak up on an unsuspecting tourist on a Boris Bikes because the ECCity 50’s 4000w is equivalent of a 50cc petrol engine so it soon runs out of puff around about the 35mph mark so you have to pick your fights carefully. Surprisingly, well, surprising to me at least is how unlike a conventional 50cc scooter the acceleration, speed and handling seemed. It was completely unaffected by weight even with its own rather hefty 150kg start weight plus two passengers fully loaded with heavy camera equipment. You really can load this thing up it has a massive storage compartment under the seat, two smaller ones in the front fairing with a usb port and a fairly large top box out back, if anything the handling seem to improve with the extra weight. It could not be easier to charge the Artelec under the seat you will find a 2-metre long lead with conventional plug at the end of that you simply pop in to a domestic wall socket at home or at the office. You can get a converter lead so you can charge it at the road side charging points but why bother the little scooter really isn’t very power hungry; the official figures are 9 hours of charges will give you a 75-mile range. Now what does that mean in the real world? Well leave it on charge overnight, go to bed and hey presto its fully charged in the morning and that will realistically give you more range to you can possibly use in a day. It’s all virtually free, well around 20p to 50p depending on who you ask and what energy deal you’re on but that’s cheap in anyones book. Maintenance costs are almost non-existent, all you need is tyres and brake pads and the battery will last well over 30,000 miles. So, the build quality is excellent and its good looking (for a scooter at least), it’s well equipped and fun to ride (again for a scooter), practical with plenty of storage, it’s comfortable enough to ride all day and it does all of this with virtually no running costs so it’s a no brainer right we should all rush out and buy a ECCity 50. Right? Well I’m afraid not because there are a few problems and they are rather big problems. The first problem is that there is no way of locking or securing the Artlec. The back wheel is solid because the electric motor lives in there so you obviously can’t lock that and the front wheel is just solid enough so you can’t put any kind of chain through and therefore are unable to lock that. The holes in the disk brakes are just too small for any disk lock to fit on to it, so your only lock is the flimsy steering lock which is simply not good enough, especially not here in London. But the real elephant in the room is the £6,495 price tag, that’s an eye-watering amount of money for something that can only do 35mph, I know that all electric vehicles are expensive and I know roughly half of that price is the lithium-ion battery from Samsung and I also know you will get a government grant of roughly £1500 but that still leaves £3,247. That’s still a grand more than most 50cc petrol mopeds, I’m not sure that people who will buy a ECCity 50 are the same people who buy 50cc mopeds but one thing I am sure about is that I’m going to miss the little Artelec and its witchcraft and black magic fun. 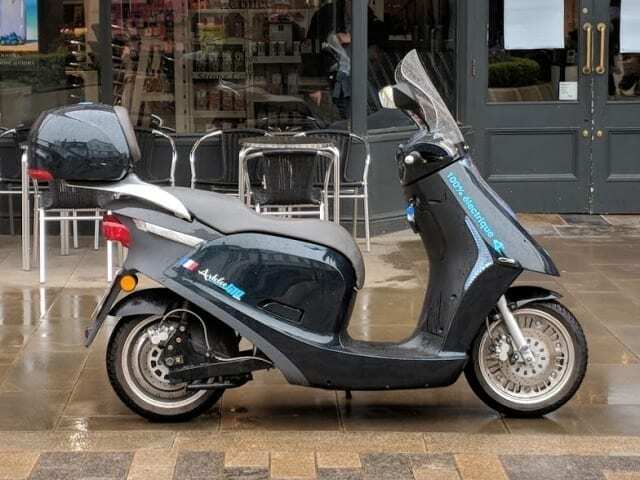 This entry was posted in Posts and tagged ECCity Artelec Electric Moped Motorcycle on 15/04/2018 by Green-Mopeds. A customer recently was stating that it was cheaper to buy a used car for a few deliveries than take a new electric motorcycle. I wanted to base my response on facts rather than just “of course its cheaper to have electric” so I did a few calculations myself that I thought would be useful. The comparion below is based on spending about the same amount on a used car versus a new Torrot Muvi Executive which is a 125cc (L3e) equivalent bike. The car I found was an 9 year old Ford Fiesta 1.25 which had about 71,000 miles on the clock. (www.motors.co.uk) as per below that cost £295 cheaper than the Muvi. Im not totally sure that comparing a car of that age with any other new vehicle is right but that’s the basis Ive made. I then used various sources to come up with rough figures for most of the major aspects required and then assumed both would do about 15,000 miles and require a new set of brakes, discs, pads etc, 1 MOT and some servicing during that time. I left out insurance as Im not sure if there would be a difference between the two. Based on the above, the car is 71% more than the Muvi after 3 years and by the 4th year, it is almost 100% more. The majority of this difference is petrol costs and servicing and this is also excluding additional incidentals like oil, wipers etc that wouldnt be included in a service. Even if, for example you assume that the car would only cover 10,000 miles instead of 15,000 because it can carry more and therefore has 1 less service, the car is still 45% more. I accept that this might not be all the considerations but based on the above, I cant really see how a car would be cheaper and that’s before considering the other issues that might affect a car of that age. In fact, based on the above, the only way I see for the car to be cheaper would be if was free to purchase and that still would only be until the 4th year and then the Muvi would then cost less. In addition, the bike comes with a 3 year warranty on the batteries and a 2 year warranty on the bike itself which of course an 8 year old car would not have which could possibly add a significant additional cost to it. Other bikes from us are more or less to buy but I think this is a fair comparison of the advantages of choosing an electric motorcycle over a 2nd hand car. This entry was posted in Posts on 12/03/2018 by Green-Mopeds. Lightning Motors LS-218 Electric Motorcycle. 100-mile range, 218 mph top speed. Whoa. 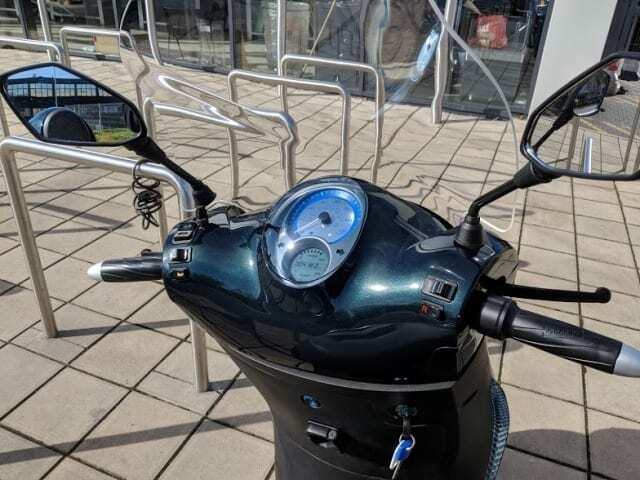 This entry was posted in Posts and tagged #EV Electric motorcycles on 09/03/2018 by Green-Mopeds. At Motorcycle Trade Expo yesterday at Stoneleigh Park, Kymco had a plethora of their range on one of the larger stands. Many might have missed two smaller bikes in the corner without a price attached to their displayed card which both had the tell-tale sign of no exhaust pipe. On speaking to them it turns out Kymco are looking at launching their Cozy here in the UK but not before validating the market through a survey of potential dealers. On looking at their Chinese site and reading some of the news, there are two things that are clear about this motorcycle from their perspective. Firstly, they have seen what GoGoro have been doing to their south in Taiwan with recent press saying they have shipped 50,000 units in just 2 years. To put that into some sort of perspective, in 2016 across the whole 27 countries of the EU, there were just over 22,000 electric mopeds AND motorcycles sold. That would also equate to about 10% of ALL motorcycles in 2016 across UK, France, Germany, Italy and Spain combined so Kymco clearly wish for a slice of that. Technically however, there is little comparison to be made. Gogoros bike has a 6400w motor, 55mph speed (L3e), 55 miles range and weighs 140KG. The Cozy is just an 800w 40KG bike with a sub 20mph speed and 35 mile range (the Cozy plus doubles that). GoGoro also have the Battery Swap system so you own the bike but can swap the batteries at will at one of their battery stations (Tapai has about 400 of these). The UK is a long way away from even contemplating that. However, looking at the Kymco Chinese site, they are thinking of a different market. They position it as the “COZY student electric bicycle” on their funky mini-site and mention about using the bike to get to school. With that in mind, of course the bike has a App which provides access to the Kymco NooDoe network which among other things, connects you to a network for fellow Kymco bike owners (not just Cozy riders). Some fea tures worth noting are around the battery. Firstly, the main “mother” lithium removable battery is stored under your feet saving space from the other compartments. Secondly they provide a smaller battery (about A5 size) that has about 7 miles of backup range and is small and light enough to carry in a rucksack or bag and can be charged from a USB socket. Personally Ive had a few requests from people asking about standardised charging and if USB could take a big enough charge, it could be an interesting idea. Anyway, the survey is fairly simple asking about if Dealers think electric is a viable option in the UK and what price it could be sold at etc. However, with just 800w, Im not sure it would provide enough power or range to make it viable. If you would like to contribute to the short 5 question survey, its here. This entry was posted in Posts and tagged #EV Electric Motorcycle kymco on 16/01/2018 by Green-Mopeds. This entry was posted in Posts and tagged #EV Electric motorcycles EICMA on 20/11/2017 by Green-Mopeds. Today when you go into your car or motorbike dealer, most of the decision criteria is based on the traditional aspects that we all know well. Brand or reputation of the vehicle and/or dealer might be your primary concern, but performance, features, economy and of course your budget all play into the final decision. Going back to the beginning of motorised transport however, when Henry Ford released the model T about 110 years ago, none of those choices were really available apart from could you afford it? “Any colour as long as it’s black” was basically it but yet thousands were ordered in a matter of days. There was no choice because although cars had been around for some time, the technology was still in its infancy and customers therefore had to take what they were given. Today with 100% electric, some of that approach should apply again. For petrol cars and motorbikes, no one really should consider using their vehicle whenever they want or being able to get wherever they want because the infrastructure exists to do that and the fundamental technology in the internal combustion engine has been around for well over 100 years. Secondly, no one should really be concerned that their driving style affects their range because unless they have super car, they will still be able to top up when they need, unless of course they ignore their petrol gauge or get caught for speeding. However, with electric and specifically with the motorbikes and mopeds, just like when you purchased your brand new shiny black Model T, the first consideration will nearly always be range. Not that I was around but I wonder if the streets of Detroit soon became littered with abandoned Model Ts that had run out of petrol, kerosene or ethanol while people with horses and carts sniggered at them while thinking that Petrol cars will never catch on for the masses! In the world of iPhones, Laptops and Tablets they get that the technology is limited by battery life and they also get that the infrastructure isn’t there yet. More so than Europe, we are still in the early-adopted phase of what will become the norm especially with Government regulation now putting a stake in the ground over 2040. So if the customer gets it, dealers should too? There’s no doubt this revolution is coming but they need to change their thinking on a few levels. First, embrace it. From what I’ve seen, dealers appear to be reluctant to take on electric which could be that they feel they will lose the follow-on revenue from maintenance and servicing that petrol cars demand. With the simplicity of sealed hub-motors and a battery that often can just be swapped if it develops a fault, often for free under warranty, the servicing aspects often reduce down to consumable elements that can be done either yourself or at any Kwik-fit or Halfords AutoCentre. With more revenue from servicing than sales, you can understand this reluctance from a dealers perspective especially when you consider the cost of sales people. Meanwhile there are customers wanting to move to electric and not getting what they want. I’ve heard stories of people actually asking dealers about electric only to be gently nudged back on to a petrol equivalent. Secondly, with this different priority of considerations on the customers mind, one would argue that the sales person needs to take more of a consultative approach and rather than just sell features, they need to understand more thoroughly what the customer typically will want to do with the bike. Of course, electric motorbikes and mopeds have different classes and performances possibilities just like their petrol equivalents but fundamentally the range, charging time and almost certainly fixed versus removable batteries are crucial decision criteria no matter what features the bike have and even the brand. A perfect example of why this consultative approach should be adopted is fixed versus removable batteries. There are arguments that fixed batteries are the way forward. After all, they can be built to utilise all the space available and hence provide longer range which is after all a primary consideration. However, if you are live in an apartment with no garage or ability for an external charging point, would you really want to rely on a public charging station which might be taken when you need it? If on the other hand you have a readily available charging point and you only using the bike well within the range of the battery, it might be perfectly adequate. These fundamental considerations might make the decision for you no matter what the brand you want offers. As is shown, fundamental practical aspects right now are more important than brand and styling and they are prepared to pay more for the bike but expect to recoup that initial investment via low on-going costs. This suggests a few things. Firstly, a dealer should not necessarily play the brand card and rely on the reputation of the manufacturer or even how it looks to sell a bike. Currently your customers do not seem to care that the machine comes from Germany or China (as a lot of them do). Secondly a dealer should also accept like their car equivalents, that customers are prepared to pay more for their electric equivalent up front and save money later. In other words, it’s a change of where the money comes from for the dealers that presents the opportunity right now and once that is understood, the barriers to adopting electric bikes as part of a dealers product portfolio should be more acceptable. This entry was posted in Posts on 01/11/2017 by Green-Mopeds. Here you will find our blog posts, commentary and other insight in to the electric moped/motorbike industry. This entry was posted in Posts on 30/08/2017 by Green-Mopeds.